Truro City have completed the signing of Bath City midfielder Ben Adelsbury. The 24-year-old, who was with Truro before their financial problems in 2012, signed a deal on Tuesday after Truro's game at Bath was postponed. 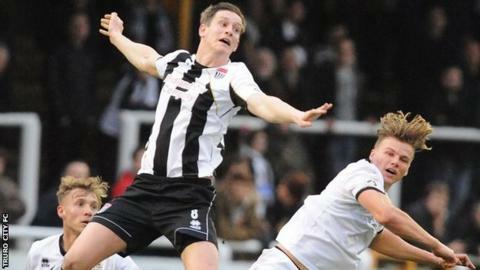 "He's a player that we tried to get in the summer," Truro manager Steve Tully told BBC Sport. "He's athletic, he's got a big presence about him, he'll bring competition for places and he's a player we want to get involved as soon as possible." He added: "It's taken us six months for us to get him but we're delighted he's on board now." Truro are currently two points off the play-off places in National League South and Tully hopes his squad is deep enough to sustain a push for a play-off place. "We've got a squad of 19 or 20 players all vying for those 11 starting places," he said. "Everyone's going to be needed and that's what we've emphasised to the players - everyone is going to be needed over the next six to eight weeks."